Over the past decade, Valentine’s Day has become increasingly popluar in Iran. 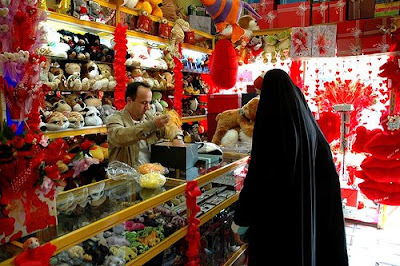 Pictured (above), a chador-clad Muslim woman makes a St. Valentine’s Day purchase. Photo by Nima Afshar Naderi. Pictured (below) Qaem Shopping Center, Tajrish, Tehran. Photo by Sharto. All images from 2007. Red, Red, Red: It’s as if the color were splattered on the city’s stores and shopping centers. 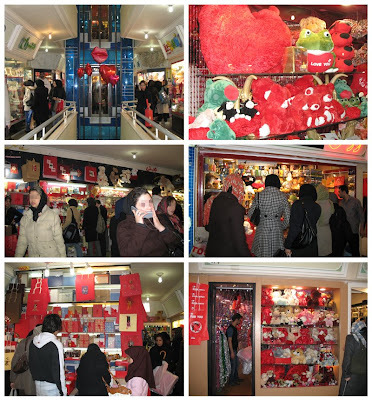 Unlike Saudi Arabia, where officials banned florists and gift shops owners from displaying anything red until after Valentine’s Day, Tehran was bustling with shoppers with a penchant for everything heart-shaped and red. Over the past few years, Western holidays like Halloween and Christmas have caught on in Iran, but none as successfully as Valentine’s Day, which has been making its way into the Iranian consciousness for well over a decade. True to form, malls in Tehran were flooded with young Iranians in search of the perfect gift. Even the more traditional gold stores and utilitarian drugstores did not escape unscathed and bore some signs of this approaching day of love. The phenomenon has spread from the populous capital to some far flung provinces, including Khalkhal in the mountains in the northwest province of Ardabil, where youngsters seemed giddy with anticipation. In a matter of time, teddy bears imported from China will have made their way to Iran’s smaller villages, where they will be on sale for Feb. 14. So far this year, authorities seem to be looking the other way. Wednesday evening, in the large shopping district of Gisha-Nasr, even some middle-aged folks joined the ranks of youngsters queuing up to have their purchases of chocolate, stuffed animals and red velvet roses gift wrapped for the occasion. Officers of “Gasht Ershad,” usually on the prowl for inappropriate dress and behavior, looked on passively. The silence, however, betrays a deep sense of discontent just below the surface. A conservative member of the parliament’s cultural committee said exchanging gifts in a lawful relationship could be the key to solving the problem. “Young men and women entering the university can enter into a ‘temporary marriage’ with a four-year duration,” he said. “After four years, they can get married — or not. It would not be a big deal if they decided against marriage” after this period was over. In the meantime, the MP said celebrating Valentine’s Day in the present form was wrong and inappropriate for Iranians. Mohammad Reza Zayeri, a conservative cleric active in cultural affairs, was among those who suggested naming the wedding anniversary of Ali, the first Shia Imam, and wife Fatema, the ‘day of love’ in Iran. Hossein, a student at Azad University, in Roodehen, said there was a massive celebration this year at his school to commemorate Imam Ali’s wedding anniversary. “We were strongly encouraged to carry on this celebration in the coming years and to adopt the occasion as our ‘day of love,’” he said. So far the proposal has not met with much enthusiasm. In the south Tehran neighborhood of Imam Zadeh Hassan, smiling young men and women happily handed over blue and green bills for teddy bears coming in a variety of sizes and heart-decorated boxes of chocolates. Still the astronomical hike in the price of decorative flower baskets around Hosseinieh Square in more affluent north Tehran made the unofficial holiday look more like a trend pushed to feed a cropping commercial enterprise than an excuse to express deep matters of the heart. Valentine’s Day is also a windfall to the telecoms industry, as millions of youth use their cellphones to text messages of love to one another. Still others will resort to the relative anonymity of the Iranian blogosphere to express these sentiments. You are currently browsing the archives for the Temporary Marriage category.